I just looked over at my “Project Progress” widget. Yikes! How did I end up with so many projects?! Let’s see, I’ve got The Cardigan, which has stalled out a bit. I haven’t really touched it in a while. I’ve been telling myself that it’s because I have more important things to work on, but I fear that I might be getting bored. Maybe I’m just not in the mood to knit so much stockinette right now. The cardigan measures a whole seven inches. That’s a lot more inches that I need to knit. But I shall conquer it!… just not yet. 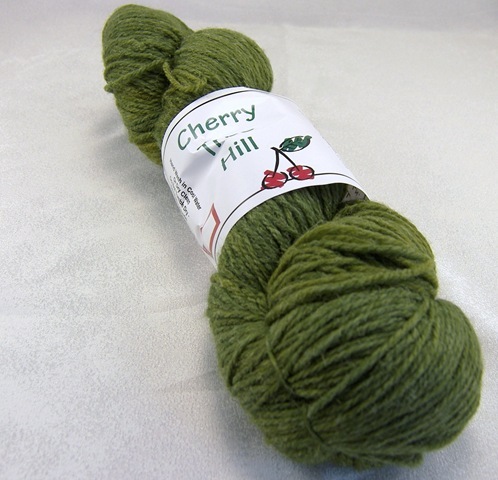 Next on the list is a pair of socks knit from Cherry Tree Hill’s Sockittome in the Loden colorway. These socks are destined for a submission to a publication, so I can’t show you more than the yarn. The yarn is a little stiff but I think it’ll soften up wonderfully after being washed. It’s got good stitch definition and cables nicely. I like it a lot and I think I’ll be adding Sockittome as a solid sock yarn to my yarn quiver. As far as project progress, I just finished the gusset on the second sock, so not far to go on these! The sock blank socks are the pure stockinette socks that I’ve been knitting since my trip to Virginia. Top-down, short-row heel, standard toe. They’re a great project for keeping the hands busy without paying attention. I’m not exactly happy with the way the colors turned out. 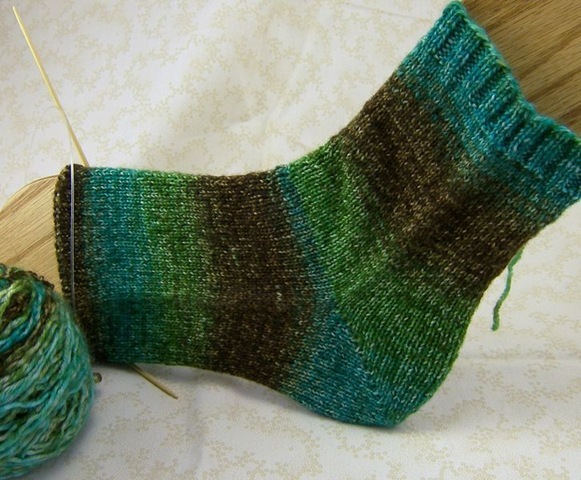 I’m almost finished with the first sock- just have the toe left to do. These socks are low on the priority list, really more of a back-up project. 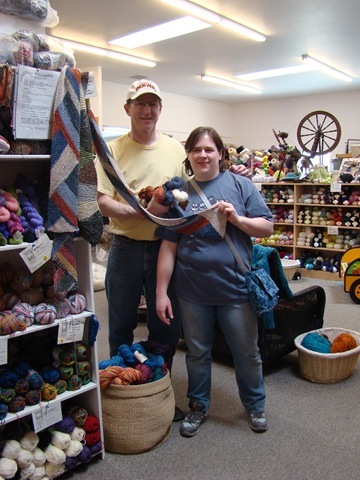 Norman’s scarf is a project that my father-in-law requested while we were at Village Wools. Sadly, this is the best picture of the scarf but not the best picture of the two of us. But this is proof that even layman can’t go into a yarn store without being inspired! He picked out three colors of Mirasol Sulka, which is a luxurious blend of silk, alpaca and merino. Really lovely to work with, especially in garter stitch. You might recognize the scarf as a non-variegated version of the Multidirectional Scarf. 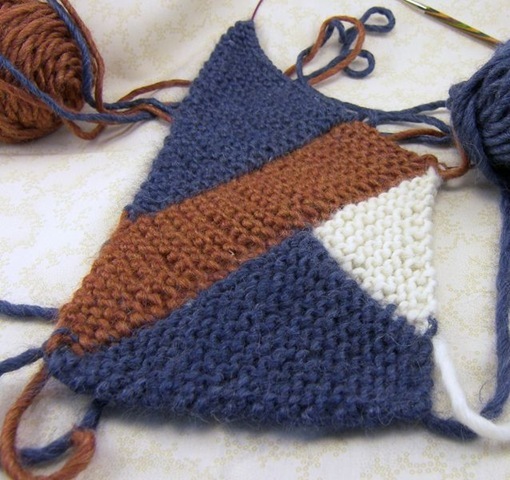 First I had to learn a little about modular knitting and then I planned out the color changes for the intarsia. I’ll be putting up a tutorial for working the Mulitdirectional Scarf with intarsia in the next few days. Now it’s just a matter of knitting the rest of the scarf. What I’ve got here is about twelve inches on the long side (but only seven on the short side, shhh). I’ve been trying to keep the scarf cat-hair free, which means that it stays in the cat-free guest room. It works up pretty fast, so I’m hoping that I’ll have it finished soon! 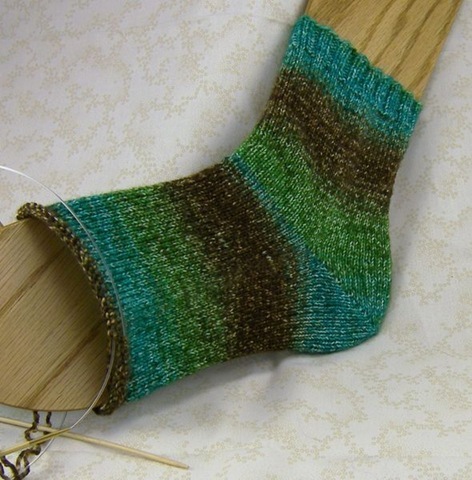 The Shibui Knits socks will be the next pattern that I publish on the blog. Hopefully. If nothing goes wrong. I finished sketching (er, imagining, I can’t really sketch) the socks last night but I have to wait until my new needles get here before starting them. I tried swatching the yarn with size 1s (2.25mm) and 2s (2.75mm) and neither was quite right. So I ordered some 1.5s (2.5mm) needles which should be here soon. But for now, the socks are just in my imagination and my widget. 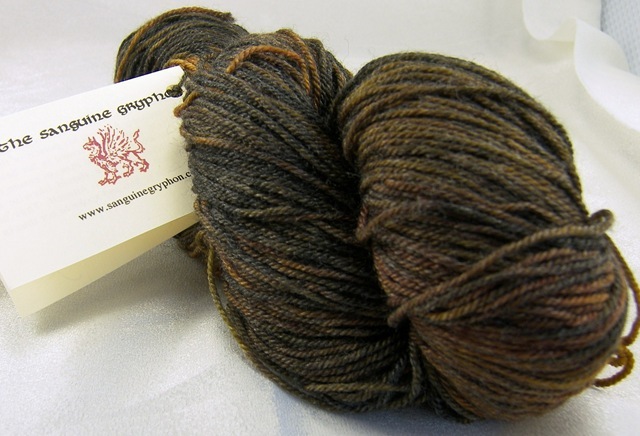 Oh yeah, I’ve also got a pair of socks planned using the Sanguine Gryphon’s Kypria. But I think they’re also going to be a submission, so you only get to see the yarn again! I have high hopes for this yarn, it seems really yummy so far! So yeah, I’d better get back to knitting! I love these mittens. They’re easy and quick to make and they’re so incredibly soft and warm. I named the mittens after a ski run on Blackcomb Mountain, since we’re going to be wearing our mittens in the village (while drinking hot chocolate) after a long day of skiing. The cable in the center is nicely unisex, making this pattern a good addition to the "how could I forget so-and-so’s gift?" pattern pile. The cable is just enough to keep things interesting and, as an added bonus, easy to memorize! Another bonus: after the ribbing, there’s no more purling! 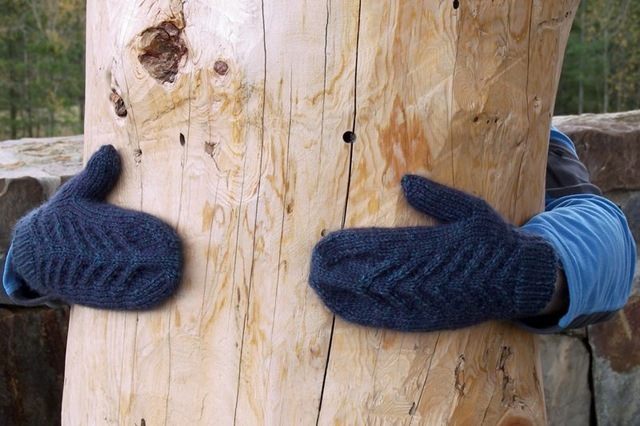 These mittens can be scaled to any size and the pattern offers instructions in three sizes. Small will fit small women’s hands or large kids’ hands. Medium will fit most women and small men’s hands. Large will fit large women’s hands and medium men’s hands. The instructions for left and right mittens are the same except for the placement of the thumb stitches. You can read more about the afterthought/peasant thumb here or EZ’s method here. The yarn used is a worsted weight, about 10 WPI. I highly recommend the Road to China yarn, but it is pretty expensive unless you can find it on sale. Try to find a replacement yarn with alpaca, wool, and silk (difficult, but worth it!). Wool for elasticity, alpaca for warmth, halo and weight, and silk for the depth of color and softness that it brings. Knit Picks Andean Silk or Classic Elite Portland Tweed might be good substitutions. Edit 11-27-08: The cuffs of these mittens are kind of loose, so if you like snug mitten cuff, try going down a needle size or two. You can also cast on fewer stitches, but then you have to add more increases to the hand. 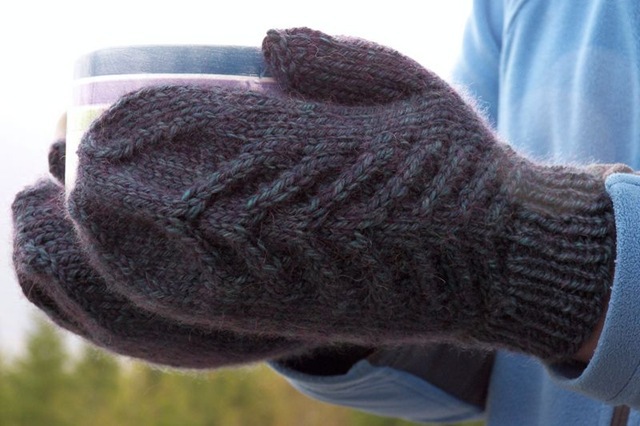 I kind of like the looser cuff for mittens (but my glove cuffs must be snug!) but Lowell likes them snugger. I just want to save you the pain of having to rip out a half-done mitten just to re-knit the cuff. Edit 12-01-08: The thumb instructions had some issues, so I’ve changed the instructions in the brackets to fix the problem. 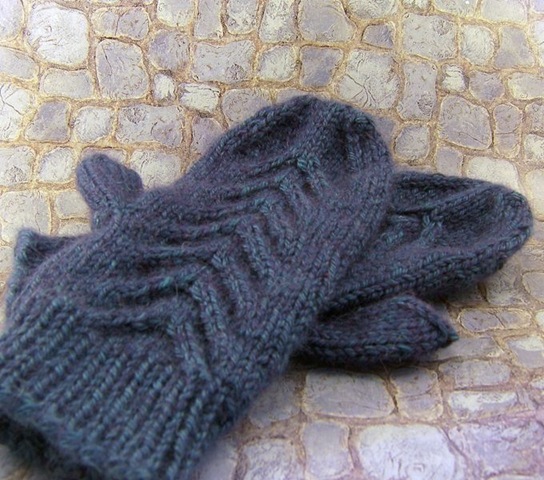 The stitches for the thumb should be the first stitches of the second half of the right mitten. (Did that make sense?) Left mitten thumb is fine. Also, the small size instructions actually include instructions now. Oy. Can’t explain what happened there. Proof-reading fail. Sorry! Errata/fixes are in purple. Edit 11-16-09: Added “join in the round” to instructions. Oops. 1×1 Rib: K1, p1 to the end of the round. m1: Insert the tip of the left needle from front to back under the strand of yarn between the stitches and knit into the back of this new stitch. C4F: Slip next 2 sts to cable needle and hold in front. K2, then k2 from cable needle. C4B: Slip next 2 sts to cable needle and hold in back. K2, then k2 from cable needle. CO 34 [40, 46] sts. Join in the round, being careful not to twist. Round 1: K2 [3, 5], [[C4F, k8, C4B, k2[3,5]], knit to the end of the round. Round 3: K4 [5,7], [[C4F, k4, C4B, k4[5,7]], knit to the end of the round. Round 5: K6 [7,9], [[C4F, C4B, k6[7,9]], knit to the end of the round. Repeat Round 1-6 until the mitten measures 2.25 [2.5, 2.75] inches from the cuff, ending on any round. Right Mitten: Next round, continuing the pattern as established, work to the end of the double brackets [[ ]] then knit the next 4 [5, 6] sts with the scrap yarn; slide scrap yarn sts back to the left needle and knit them again with the working yarn. Left Mitten: Next round, continuing the pattern as established, work to the last 4 [5,6] sts of the round, then knit the next 4 [5,6] sts with the scrap yarn; slide scrap yarn sts back to the left needle and knit them again with the working yarn. Continue working Rounds 1-6 as established until mitten is about 1.5 [2, 2.25] inches short of desired length (about 4 [5, 5.5] inches) not including cuff, trying to end on Round 5. If not, continue working the instructions in the double brackets [[ ]] if possible during the decreases. Cut working yarn, leaving an 8” long tail and graft the remaining stitches together using Kitchener Stitch. Carefully remove scrap yarn from the thumb stitches, placing live stitches on two needles. There will be 4 [5, 6] stitches below the hole and 3 [4,5] above. Join in the round and knit until thumb measures .75 inches shorter than desired length. Cut working yarn, leaving a 6” tail. Thread the tail through the remaining stitches and fasten off.